One of the oddest facts about the Peterson Park neighborhood on Chicago’s Northwest Side is that that the 24-acre Peterson Park doesn’t actually lie within its boundaries. Peterson Park (the neighborhood) is a small wedge of West Ridge bounded by Bryn Mawr, Lincoln, and California avenues, and the eastern bank of the Chicago River. Peterson Park (the park), on the other hand, is a few blocks west of the river in neighboring North Park. Got that? Like North Park, Arcadia Terrace, and the rest of West Rogers Park, Peterson Park is home to a mish-mash of races and cultures, including residents with Eastern European ancestries and Asian immigrants hailing from places like India, the Philippines, Korea, and China, according to the last census. 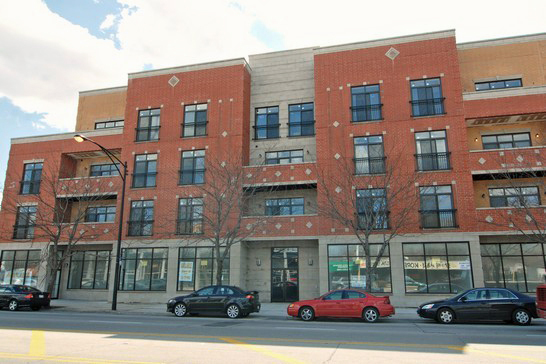 All of the condos currently on the market in Peterson Park are two- and three-bedrooms on Lincoln Avenue and Mozart avenues. They range in price from the $220s for a new-construction two-bedroom / two-bath at 5862 N Lincoln Ave, to the $430s for a new three-bedroom / three-bath at CityView, 5760 N Lincoln Ave (shown above). Just three single-family homes are currently available in the neighborhood, and all are located in the 5600 and 5700 blocks of North Virginia Avenue. A three-bedroom at 5634 N Virginia Ave and a four-bedroom at 5645 N Virginia Ave are priced in the $540s and $590s, respectively, and a home at 5760 N Virginia Ave is listed as a foreclosure.